The Mets this week made what ought to go down as one of the more important personnel moves in recent history with the trade of beloved knuckleballer R.A. Dickey (along with both of his catchers!) to Toronto for catcher prospect Travis D’Arnaud, young pitcher Noah Syndergaard, veteran catcher John Buck and very young outfielder Wuilmer Becerra. Given Dickey’s age, the Mets’ needs, and their limited resources, dangling him in a trade was absolutely the right thing to do, and from here it’s on D’Arnaud and his mates to make it worthwhile. I don’t for a minute believe the Mets necessarily “punted” on 2013, 2014 or whatever, I’m certain they can repeat a 4th place showing with or without a few hot new prospects and optimistic they might do more. They might not either, but that’s why they play the games. 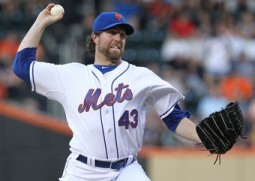 As for Dickey, what can you say. He was a great Met, and we’ll miss him, but this was one opportunity where the Mets had a hammer, and I’m pleased to see they used it. Even more shockingly, they managed to unload both Josh Thole and Mike Nickeas while doing so. Thole, who looked like a backup goalie in his. No. 30 jersey, probably still has a chance to hit .300 but I’m glad he won’t be trying it with us. That Nickeas could be included in any deal almost defies reason: The Mets fearlessly whacked him from the 40-man roster this offseason but getting him back into the fold on a minor-league deal was one of those tiny details packing a potentially big payoff. It also miraculously resuscitated the Tim Bogar Trade Chain with four new branches when I was certain it was dead. Good job on that Sandy. Nickeas leaves behind No. 4 and previously wore No. 13. If we needed the reminder (you probably don’t) that not all hot prospects work out, Mike Pelfrey quietly signed a make-good deal with the Twins this week. I have to admit that I pulled just as hard if not more for Pelf to succeed here than Dickey. He looked like a great power pitcher until you saw the doubts and poor results that tortured him here: I wouldn’t be surprised if I found out he was hurting for longer than we knew. 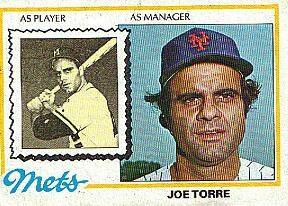 Finally the Mets added an outfielder. Collin Cowgill probably wasn’t high on anyone’s wish list but he’s a right-handed hitter (and lefty thrower!) who reportedly can go get it in center field, suggesting at worst he could platoon with Kirk Nieuwenhuis. Cowgill, acquired for minor-league infielder Jefry Marte (an Omar-Era International signee briefly considered a real prospect) wore No. 12 most recently in Oakland and No. 4 previously with Arizona. Of the Toronto arrivals, D’Arnaud is listed as No. 15, which ought to be available unless Fred Lewis comes back or makes a stink and I wouldn’t expect either. John Buck in this article passed along by MBTN reader Matt details his reason for preferring 14, but with that number retired, could choose 44, 4 and/or 34. We’ll know in a matter of hours what number they put on newly acquired catcher Kelly Shoppach, whose customary No. 10 is worn by manager Terry Collins (in honor of his mentor Jim Leyland in case you didn’t know). Popular speculation includes 20 and/or 22, but it might be fun to see him wearing No. 6. Then he can take 10 in the event Terry gets whacked for overseeing a sonambulent second-half yet again, though I don’t think that’ll happen). But seeing as someone should take the blame for this rotten second half I wouldn’t be shopping for a home in the area were I Dan Warthen. I think Terry serves until the Mets are truly ready to contend then step aside for the post-turnaround leadership. Not that I don’t want him to succeed, but Josh Thole to me has looked in desperate need of a lengthy break since well before the All-Star Break, and increasingly appears as though his best role will be as a backup. We gave him a shot anyway. This Shoppach move gives us a look-see at a guy who can be a free agent after the season, at the cost of a player-to-be-named. You guys already know that Johan Santana is back (on the roster anyway) and that Garrett Olson has already washed out as a lefty reliever. UPDATE: Sure enough he’s a 6. Yeah! Well, it’s good to see the Mets determined to do something about the Frankie Rodriguez situation and with a little luck, these last weeks of the year might demonstrate just how little creativity, imagination and good sense they’d showed when making that deal in the first place. Not for nothing but the post-Rodriguez bullpen hasn’t given up a run in 13.1 innings. That doesn’t mean they’re necessarily going anywhere. Their offense is a much tougher fix — always has been — and it’s probably buried them in a deeper hole than they’ll ever hit out of. To that end, they welcomed Rod Barajas back to the roster today and sent Fernando Martinez back to Buffalo. Jerry seemed unable to commit to the kid anyhow, and surely Barajas will only take playing time from Josh Thole, at least until its evident there’s no shot with this group. Too bad. In the end it was relying so heavily on veterans with questionable offensive track records that killed 2010. To get you updated, Pat Misch was recalled and Raul Valdes sent down; Ryota Igarashi went down when Rodriguez returned from his two days in the penalty box but was back up upon the revelation of his injury and subsequent assignment to the restricted list. I have no idea (nor any opinion) on how the grieveance hearing ought to go, but applaud the Mets for taking a stance here, if only to save themselves from Omar’s folly and the big lie of the Brand Name Closer. And if they don’t prevail, they’ll have gotten what they deserved. I’m out here in fabulous Las Vegas and missed most of the debacle last night that made my previous post about looking up at the Nationals in the standings prophetic. I did see however that the game included what possibly could be the last turn at bat in Frank Catalanotto‘s career. I’m glad for his sake that he got a chance, he even got his number, 27, but he sure wasn’t helping the Mets win, and he was designated for assignment last night.Chris “The Animal” Carter, whom they couldn’t stop in Spring Training and couldn’t stop at Buffalo, has been recalled to take his place and I wouldn’t be surprised that he a la Ike Davisprovides the club with a little bounce. Let’s Go Mets! 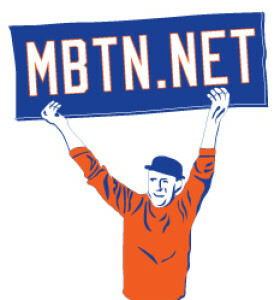 My friend Edward suggests this is a good opportunity for the Mets to break out the No. 8 jersey again (or you know, just use some old ones) but it would be most likely he alights in the same No. 23 he wore this spring. Also saw where Josh Thole replaced Henry Blanco while the latter goes to the bereavement list. Thole is back in his familiar 30. More later! With many of the likely candidates already forced up to the big league level (and the playoff roster set!) the Mets are expected to make few recalls now that the calendar turns to September and active rosters expand to 40. One exception is Class AA catcher Josh Thole, who has been recalled from Binghamton and is expected to be in uniform No. 30 for the Mets’ game Tuesday in Denver. A lefthanded hitter with a nice swing but minimal power, Thole might already be an upgrade over Brian Schneider, whose Met career is grinding to a dreadful finish. Thole will be the first Met No. 30 since another catcher, Raul Casanova, early last season. 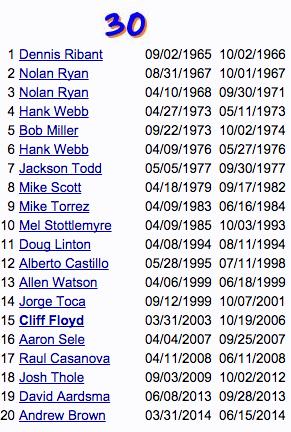 Thole will become the 52nd Met of the year, as 2009 approaches the team record of 54 players set in 1967.